I’m on an apple roll this season. After spiced poached apples, old school apple cake, and pear crisp with apples substituted for pears, I’m taking it to the next level with a more esoteric recipe. From an upstate New York monastery, it's Brother Victor-Antoine d’Avila-Loutourette's Dauphin Easy Apple Soufflé. 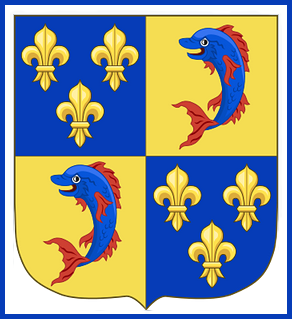 Dauphin was the dynastic title of the French heirs apparent during the 14th-19th centuries. It also translates to dolphin. 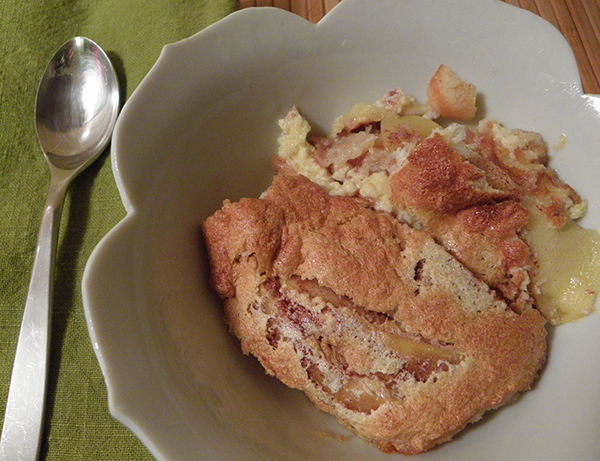 What exactly Dauphin has to do with the apple soufflé remains a monastic mystery. Unlike most baked apple recipes, this soufflé employs sweet Golden Delicious apples rather than the usual sour baking apples. I did alter the recipe somewhat. I didn’t peel the apples, though I might next time. I added lemon and salt for contrast with the sweet Golden Delicious, since egg dishes can be rather bland. The amount of cinnamon seemed skimpy, so I enhanced it. I used Brother Victor-Antoine’s recommended dose of Calvados, an apple brandy. The Calvados increases the sophistication and uniqueness of the soufflé without overpowering the delicate Golden Delicious. You might like to make Dauphin Easy Apple Soufflé for a Christmas Eve treat. If you don’t have Golden Delicious, substitute any sort of sweet apples that you have, like Gala or Honeycrisp. A blender and electric mixer make for easy prep once the apples are sliced. Serve hot, with or without a dollop of cream. A very Merry Christmas to you and yours. Peel, core, and thinly slice apples (or skip the peeling if you like). Toss with lemon juice. Set aside. Thoroughly butter a 9” x 13” baking pan. 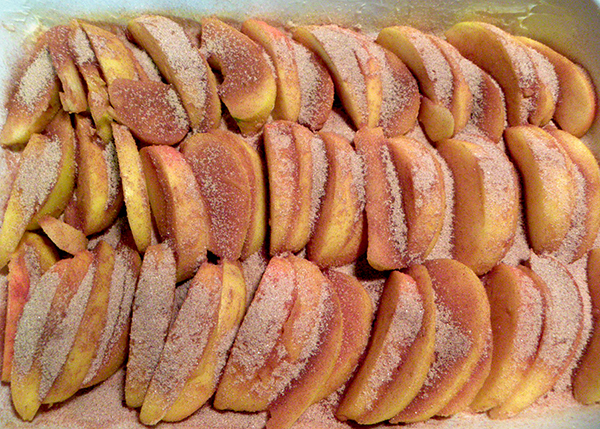 Arrange apple slices evenly over the bottom of buttered baking dish. Mix together ¼ cup sugar and cinnamon. 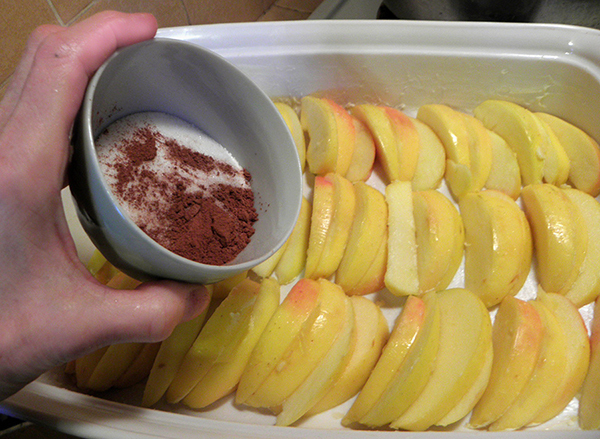 Sprinkle evenly over apples in pan. Place egg yolks and milk in blender. Whirl together thoroughly. Add remaining ½ cup sugar, all purpose flour, baking powder, salt, and Calvados liqueur. Whirl together until well blended. Pour into large mixing bowl. 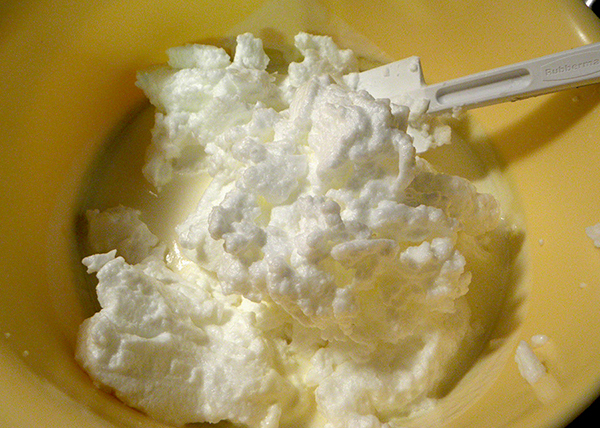 In a clean bowl, whip egg whites with electric mixer until stiff. Fold into egg yolk mixture with rubber spatula. 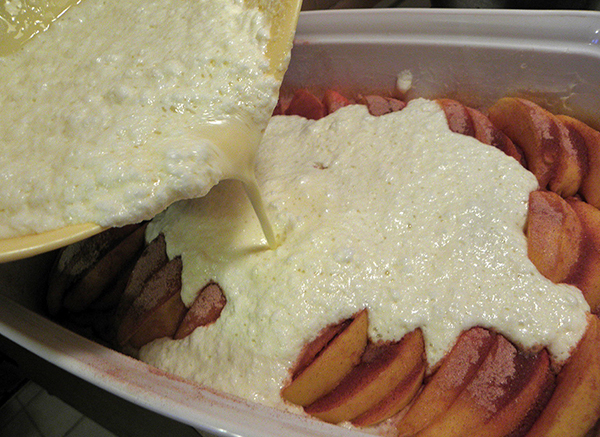 Spread mixture lightly and evenly over apples. Bake for 35 – 40 minutes, until set and light golden. Serve immediately while still hot. 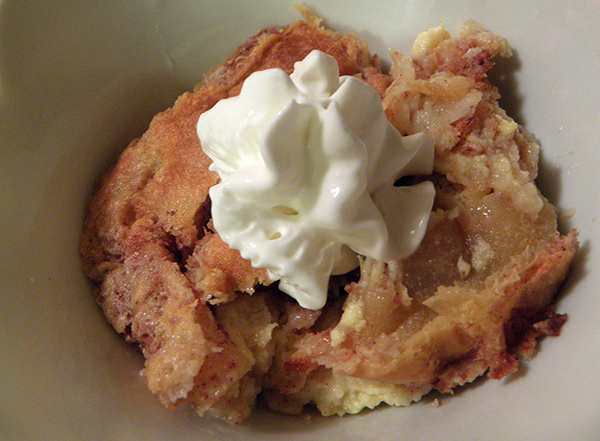 Leftovers can be refrigerated, lightly microwaved to warm (or not) and served with whipped cream.